In recent years, the use of, interest in, and controversy about Agile methodologies have realized dramatic growth. Anecdotal evidence is rising regarding the effectiveness of agile methodologies in certain environments and for specified projects. However, collection and analysis of empirical evidence of this effectiveness and classification of appropriate environments for Agile projects has not been conducted. Researchers from four institutions organized an eWorkshop to synchronously and virtually discuss and gather experiences and knowledge from eighteen Agile experts spread across the globe. These experts characterized Agile Methods and communicated experiences using these methods on small to very large teams. They discussed the importance of staffing Agile teams with highly skilled developers. They shared common success factors and identified warning signs of problems in Agile projects. These and other findings and heuristics gathered through this valuable exchange can be useful to researchers and to practitioners as they establish an experience base for better decision making. Beck, K., et al., The Agile Manifesto. 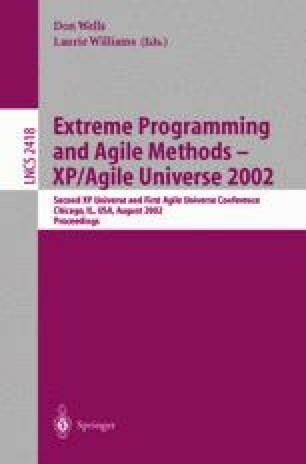 2001: p. http://www.agileAlliance.org.